Many individuals have received the mystery diagnosis of having a condition known as “Cold Urticaria”. This illness indicates that the sufferer is allergic to cold temperatures. Those that suffer from this condition often experience numerous uncomfortable symptoms. This condition is considered to be one of the top two hundred rarest medical conditions, according to the organization known as the “National Institute of Allergy and Infectious Diseases” or “NIAID”. While the exact cause of Cold Urticaria is not known, medical professionals have concluded that it appears as if the sufferers of this condition have exceptionally sensitive cells in their skin. When exposed to cold temperatures, the body of the individual allergic to cold climates releases histamine, as well as several other immune based chemicals directly into the skin. The combinations of histamine and chemicals of the immune system result in the symptoms of the condition. In this guide, you will learn several important facts about this mystery diagnosis. While medical professionals have yet to confirm a precise cause for the mystery diagnosis of Cold Urticaria, they have established some basic risks that seem to be related to the condition. These risks are derived from case studies conducted on those that have confirmed cases of the medical mystery, as well as those that were thought to have the condition. Based on the information surrounding the condition, it appears as if both males and females are at equal risk for this mystery illness. While the condition is obviously prevalent in adults, case studies indicate that children and younger adults are more likely to acquire the condition. 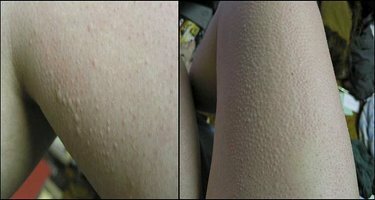 This type is identified in the medical community as “Primary Acquired Urticaria”. In most instances, this condition lasts up to three years and then, somehow, resolves on its own. In addition to age, it appears that those that have recently suffered from the effects of a viral infection may be susceptible to developing Cold Urticaria. In reviewing documented cases, the condition referred to as “Mycoplasma Pneumonia” has been linked to the condition. Additionally, “Mononucleosis” has also been linked to the onset of the condition. Many sufferers of this mystery diagnosis have what is referred to as “Secondary Acquired Urticaria”. This mystery diagnosis often occurs in those that have a pre-existing medical condition, such as cancer. In extremely rare instances, many medical professionals have found that certain traits that are inherited could result in an individual becoming allergic to cold temperatures. The condition that has been linked in this instance is identified as “Familial Cold Autoinflammatory Syndrome”. When this is the culprit of the mystery diagnosis, the sufferer of Cold Urticaria often suffers from more severe symptoms, such as feeling as if they have the flu. •	It is common for the person to notice that they develop hives. These are often referred to as “Wheals” and are usually red in color and itchy. •	When the person touches a cold object, they may notice that they experience swelling in the region of the body that comes in contact with the object. •	Many individuals that suffer from the condition may find that when they attempt to consume food products or fluids that are cold that their lips, tongue and throat start to swell. This could lead to respiratory complications, such as a condition called “Pharyngeal Edema”. •	In severe instances of the condition, individuals may find that they suffer from extreme body chills and that the rate of their heart increases. When this happens, it could result in fainting episodes. When treating this mystery diagnosis, it is important to understand that the condition cannot be cured. Additionally, doctors are unable to conclude whether the condition will resolve itself over time, or if the sufferer will experience it for the rest of their lives. However, the doctors that treat those that become allergic to cold temperatures associated with the air and/or water are able to effectively reduce the symptoms that are associated with the medical mystery. There are three types of medications that assist in soothing the symptoms of this mystery diagnosis. These include antihistamines, cyproheptadine and doxepin. If you suspect that you, or a loved one, are suffering from the effects associated with Cold Urticaria, it is essential that you make an appointment with a medical professional. The doctor will be able to determine if an allergic to cold temperatures is occurring. From there, they will be able to provide a confirmation of whether or not this mystery diagnosis is to blame for the symptoms occurring. While this is considered to be one of the biggest medical mysteries among professionals, much has been learned about the complication through the years.